WHEN ODISHA WAS hit by the super cyclone in October 1999, Atal Bihari Vajpayee had just taken oath as prime minister for the third time. While Odisha remembers Vajpayee’s subsequent contribution in helping rebuild the shattered state, Gujaratis have memories of Vajpayee doling out concessions like a five-year excise duty holiday on items manufactured in quake hit Kutch in 2001. Today, Kerala stands devastated by the floods, and all eyes are on Prime Minister Narendra Modi and what he can offer. It is said there are lessons to be learnt from history. But disaster management experts are wondering if anything has been learnt. When the tsunami hit the Indian coasts in 2004, the United Progressive Alliance government gave a clarion call to recognise disaster management as a national priority. In 2005, the Disaster Management Act was passed unanimously in Parliament, paving way for setting up the National Disaster Management Authority headed by the prime minister. This was followed by state- and district-level disaster management authorities. Vij said the NDMA was supposed to have at its disposal the National Disaster Response Force and State Disaster Response Forces, along with civil defence bodies backed by local communities. “Its mandate was to coordinate with all stakeholders like the India Meteorological Department (IMD), Central Water Commission (CWC) and state governments during any disaster,’’ he said. After the change in government in 2014, the NDMA vice chairman, who enjoyed the rank of cabinet minister, and NDMA members, who had ranks of ministers of state, had to resign from their posts. The apex body was scaled down to just four members, was divested of ministerial positions and powers, and the NDRF became the baby of the disaster management division of the home ministry, under the charge of a joint secretary. Vij said the exhaustive work done by the NDMA was laid waste today. “The world was appreciating India’s efforts post the tsunami, so much so that Pakistan took cue and set up its own NDMA after the 2005 quake,” he said. In 2015-2016, the Centre started looking to Russia to find ways to develop a centralised mechanism to coordinate all disaster related works. The home ministry envisaged a Rs 10 crore project to set up a National Command Structure with Indian Space Research Organisation forecasting capabilities for disaster-related warnings and state-of-the-art communication equipment. A blueprint of the proposal was drawn up by then additional secretary (disaster management) in MHA, Bipin Mallick. However, with Mallick moving out of his post in 2016, the proposal went into cold storage. According to former NDMA vice chairman Shashidhar Reddy , India already has enough structures and technologies in place, but need to be utilised in the right manner. “Clearly, the Kerala situation could have been handled better if there was an agency which was studying the level of water in the dams and analysing the rainfall predictions,” he said. There is a need for high resolution Digital Elevation Maps to be made available to disaster management bodies like the CWC and district authorities for identification of flood-prone areas. Initially, there were national security concerns for these maps with the Survey of India, but one set was made available to the National Database for Emergency Management recently. The state governments should also make an assessment of the area suffering from drainage congestion, and inspect dams and embankments before and after the monsoon. Before the government decides to revisit its disaster management policy, it needs to take time out to deliver in Kerala. There is a feeling that the Rs 600 crore package announced by Modi is too less and the Centre needs to declare the floods a “national disaster’’. Home ministry officials said there were no guidelines under the Disaster Management Act 2005 to declare any calamity as a “national disaster’’. At the most, when the Central government chooses to label a calamity as a “national disaster’’, it can release funds under the National Disaster Response Fund. The Kerala government wants a Rs 2,600 crore special package from the Centre for additional relief. 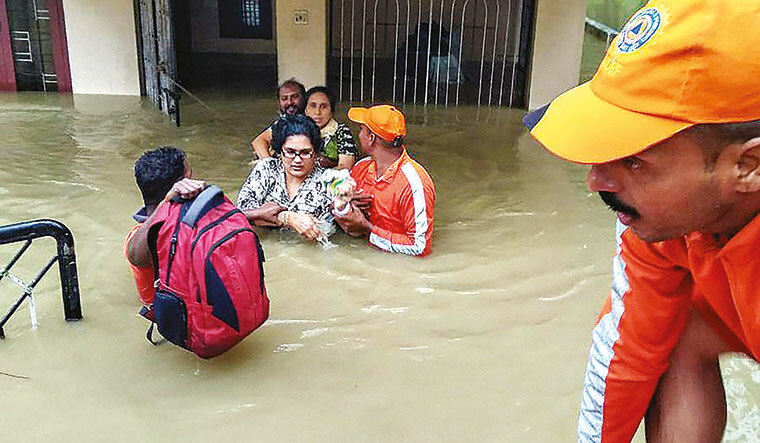 If the state disaster response funds fall short, the Centre will need to loosen its purse strings to help the state stand on its feet again. Will Modi deliver a Vajpayee touch in Kerala?